We have 2 write ups of this sponsored ride! The first one by Martin Millson followed by one by Janet Jenks. Pictures follow at the bottom of the page. We left the clubhouse at 10am and it was already hot and sunny. Two tandems and 2 solos headed out towards Wall hill lane via the busy Coundon Wedge road. Climbing up towards Corley we settled into a comfortable pace and dodged the potholes that jumped in front of us in the dappled sunlight. Stopping at the top of Corley rocks we gave some directions to some lost Polish motorists before whizzing down over the M6 past Corley services up towards Ansley. The sun was really hot now as we reached the bottom of a hill at Galley Common. We stopped for a shop break and then I managed to jam the tandem gears setting off up hill! A few tense moments , oily fingers and Dave's spanner and the problem was resolved. Over this hill then another we arrived at HartsHill the mother of all hills (at least on this route). It is steep but mercifully short and at the top we turned left and climbed up to Hartshill Hayes Country Park. Here we had our first break and met up with the Jenks’s who had arranged to meet us on the way. So now we all set off down towards Ridge Lane to pull into the cark park of Church End brewery at 12pm, opening time! After contemplating beer, cider, headaches, sleep and ending the ride the following morning, we decided to press on whilst the Jenks’s succumbed to the breweries 6% Cider. At the end of Ridge Lane we went off road through the cool woods and out the other side opposite another pub, the Horse and Jockey. All together we now headed for the Rose pub in a very picturesque Baxterly. This was our lunch stop of baguettes and beer, sitting next to the duck pond in the sun, very nice! We met up with the Jenks’s once more and after an hour’s break we decided we better move on. Soon we were in amongst narrow country lanes dotted with foxgloves, farmhouses and huge country pads. Winding through these lanes took us to Kingsbury , riding through the park it was packed with people enjoying the sunshine. Out the other side we headed towards Nether Whitacre and Shustoke. Heading out of Shustoke along the long straight of Castle lane towards Maxstoke, We were not looking forward to the long haul out of Maxstoke but luckily the village hall was open for tea and cakes. Suitably refreshed thanks to Janet and Tony we left them at that point and headed for the long slog up out of Maxstoke. Reaching the top we then coasted down through very narrow country lanes past more luxury houses and isolated farms down under the M6 and back into Corley. At the Bull and Butcher we then followed the well-worn Vista route back down through Allesley, Coundon Wedge, the Allesley road back up into Earlsdon arriving back at the clubhouse for 4.20pm. Many thanks to those that took part, Dave Franklin and Nigel Warden on Solos, Andy, Brian, and Stuart my stoker. Also to Janet and Tony for meeting up with us and paying for the tea and cake. Michelle for the wine gums! By the way we also managed to raise about £400-£500 for the club. 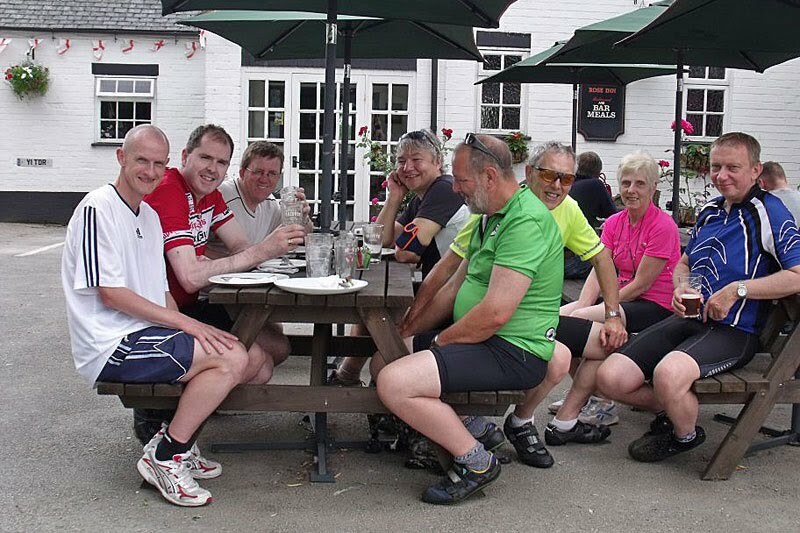 It was decided to make the Northern Warwickshire Cycleway Ride a sponsored ride to raise some funds for VISTA. It took place on Saturday 26 June which turned out to be quite a hot day. There were two tandems and four solo bikes on the ride. Andy, Brian, Martin, Stuart Nigel and Dave all started out from the VISTA garage. They joined the Northern Warwickshire Cycleway at Corley rocks and were in front of Tony and Janet who had started at Maxstoke (they wanted to do the long climb from Maxstoke first while they were fresh!) Tony and Martin conversed on their mobiles as to where they were and then we all managed to meet up at Hartshill Country Park for a quick break. We all discussed where to stop for lunch. Tony and Janet decided on Church End Brewery at Ridge Lane, as that’s where they have the best beers! The others however opted to go to The Rose at Baxterley. The route from Ridge Lane to Baxterley goes through Bentley Woods and is a bridleway, so it was temporarily off road until we cleared the woods. We all carried on to Maxstoke, where the village hall was open for refreshments as there was Flower Festival being held in the church. Tony and Janet were leaving at this point as they had completed the circular route but before they did we all went for a welcome drink and cake. Hopefully this fuelled up the rest of the cyclists to tackle the steep climb from Maxstoke. 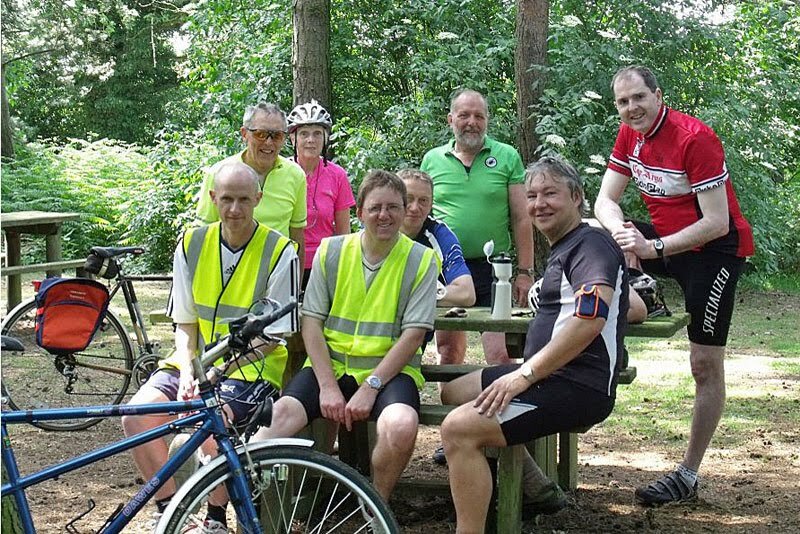 The remaining six cyclists went on to Corley Moor. However Andy, Brian and Nigel had managed to leave Martin, Stuart and Dave behind up the hill and when they arrived at the Bull and Butcher they took the road to the left to Corley Rocks. Martin and co went right heading back to the Resource Centre. However everyone managed to arrive safely back at the VISTA garage around four o’clock. The only mechanical incident of the day was a dropped chain and that was soon sorted by Dave. The ride was very enjoyable and the weather excellent, although a little too hot. Hopefully too the VISTA funds will have been raised by a few pounds. Thanks to everyone who took part.